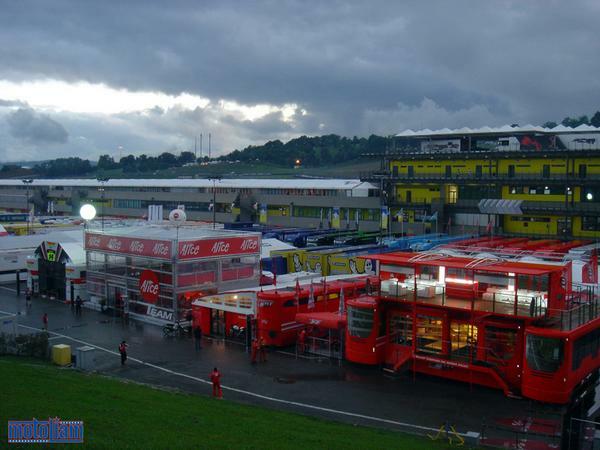 GP08 Mugello, Race 6, "Mugello, My Heart"
Mugello is a *magical* race. There's no other way to describe it. 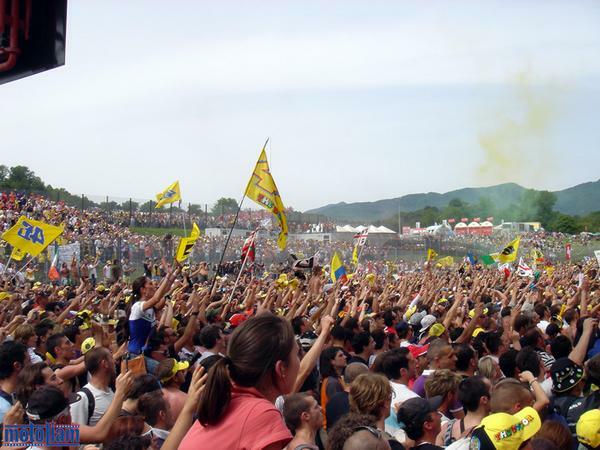 The power evident in the passion and fervor of the fans, the extra motivation from all the riders, the sheer unbridled joy of Valentino Rossi, the picturesque and romantic landscape, it is all very real and very true. 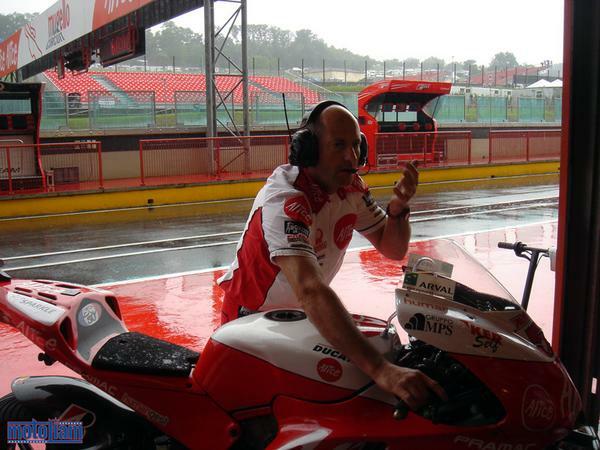 Mugello is also one of the most difficult races for me on the calendar, as it is the home race for Ducati, and many top engineers and personnel from Corse make the short trek from the Factory to the racetrack to observe, scrutinize, analyze, and begin the planning for next year's squadras. It is truly my favorite race of the season, and this year it saved my life. 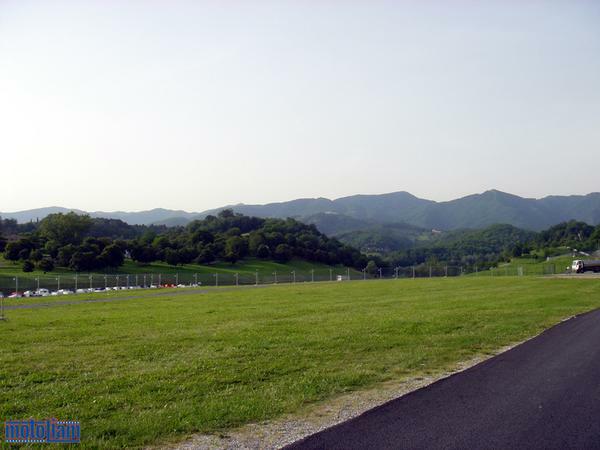 Mugello, my heart, I love you. This is a longer post, so for those of you with low-bandwidth connections, I apologize. 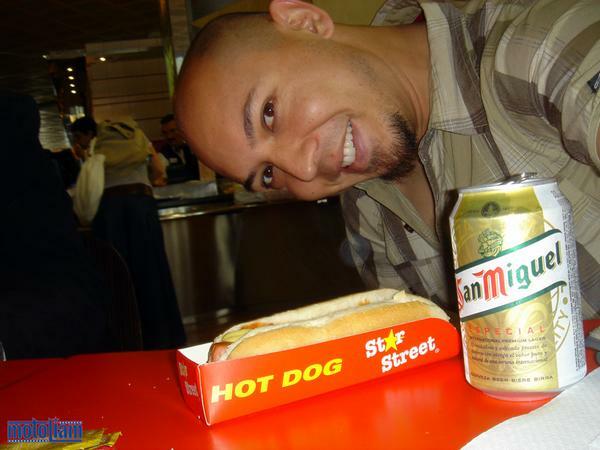 I began my journey to this hallowed ground at Barcelona's El Prat Aeropuerto. 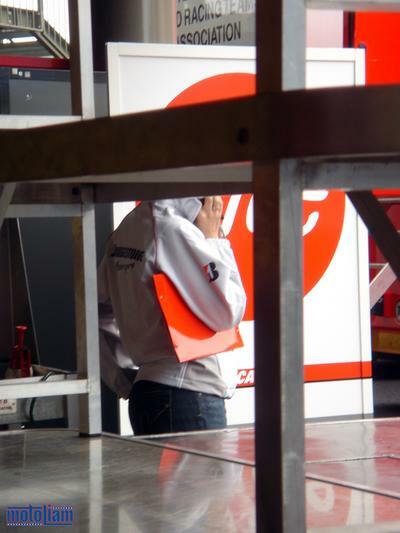 The mood from my two Team mates who joined me was somber and serious, and we knew we were headed into a rough race. Preseason and the first five races hadn't been kind to us, but there was a quiet intensity coming off of everyone, and I knew that as professionals we would do everything we could to put our boys on top. We could handle anything and everything that was thrown at us, and if we couldn't, we wouldn't be here. In my case, I was to deal with my main factory contacts this weekend in person, handling such matters as lead times for complicated electronics pieces, orders, re-orders, and other bureaucratic necessities that make a private team function well within the umbrella of the Factory. As a natural born problem solver, my mind was set on doing my all to see that my Team would be taken care of through 2008 and beyond. 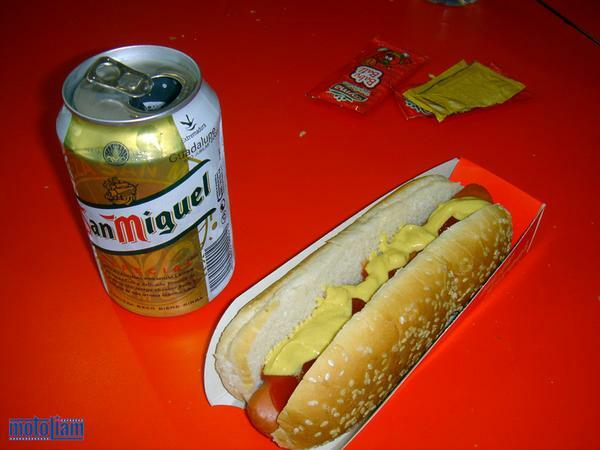 I fueled myself with this heavily mustard-ized hot dog, knocked myself out on the flight with a beer, and landed in Firenze fresh and ready to rock. I disembarked to some heavy heat, the sweat and humidity covering everything around the airport. In the distance, small hills reminded me of home, as the tall mountains I grew up around were between one and two thousand feet. Of course, the mountains I grew up with were steep and sharp, with constant strong ocean winds blowing up across the face. When I would stand at the edge of the world, looking out over a horizon that was clearly curved, I would think that the wind could hold me up, push me back. I boarded a small bus to get from the plane to the luggage collecting area, pressed up against a mess of people wearing everything from sweats and sandals, to Armani and Panerai's. Yes, I was really in Italy, home of some of the most fashionable people I've ever come across, whether or not that fashion sense was right or wrong. The common theme at the moment are these huge sunglasses, covering half a woman's face and obscuring all but the most minor of details. True beauty is found in the eyes, deep beneath the surface. Any and all attempts to shroud this aspect in mystery is just vanity, and yes, I'm guilty, too. 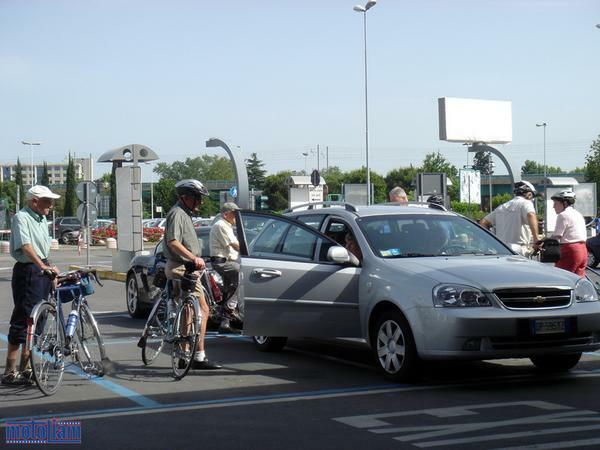 Outside in the parking lot of the airport, a collection of old-timers gathered to go on a bicycle ride, complete with chase vehicle. I was taken back by their ages, because they were elderly, but it was clear that they were on a mission and I respected their enthusiasm and drive. Italy is where passionate people live. We piled into a large van, a Fiat Ducato (same type as we used in '06), while a select few got to ride in a little Alfa micro-wagon. I wanted to relax a bit before the race week, so I spread myself out across one of the backseats of the furgonetta and let the scenery come to me. 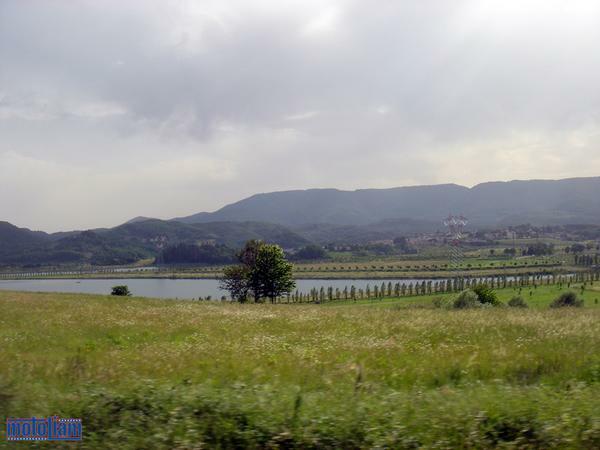 The drive towards the circuit takes you through sweeping turns along the sides of the Tuscan hills, through tunnels, past lakes and perfectly situated villages. At times, you can see lone watch towers, their stone construction having withstood the centuries, peeking up from the tops of wooded ridges. Patchwork fields abound, and this is farming country. My hayfever would activate almost immediately, hahaha. 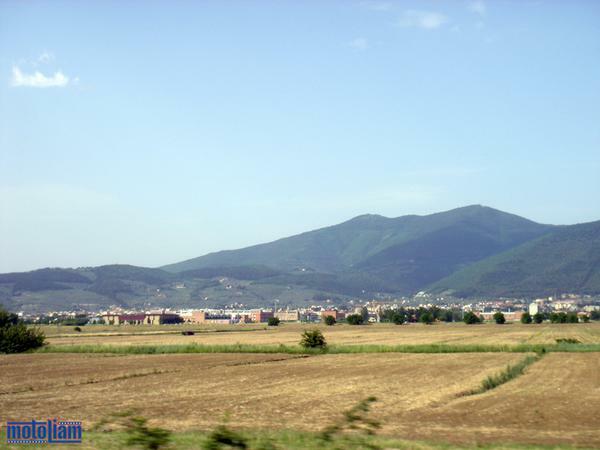 It's not a long drive, as Mugello lies between Firenze and Bologna (ok, maybe Bologna is a little further away) and both routes to the circuit are absolutely gorgeous. You feel like you're headed towards something special. And you are. 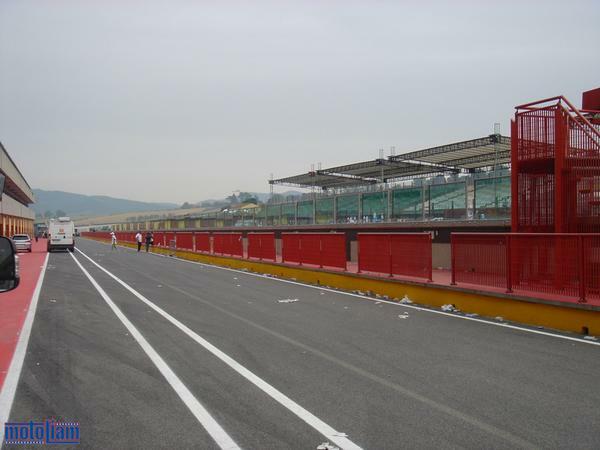 There's a new arch over the famous helmet of Mugello, and indeed, the facilities have been upgraded as well, with a new viewing tower in place and additional offices and structural reinforcement around the paddock buildings. We pulled in to pick up the four driver's of our racetrucks, who also happen to be mechanics on our team. 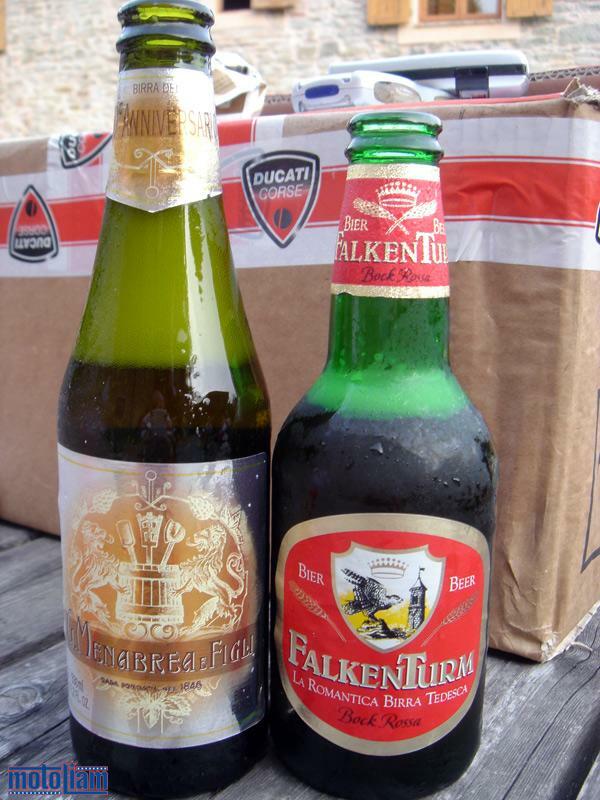 Our boys had gotten hung up on their way over from Modenas, home of Ferrari, but were due to arrive later that evening. I spent some time stretching my legs and taking in the various teams setting up for the weekend. 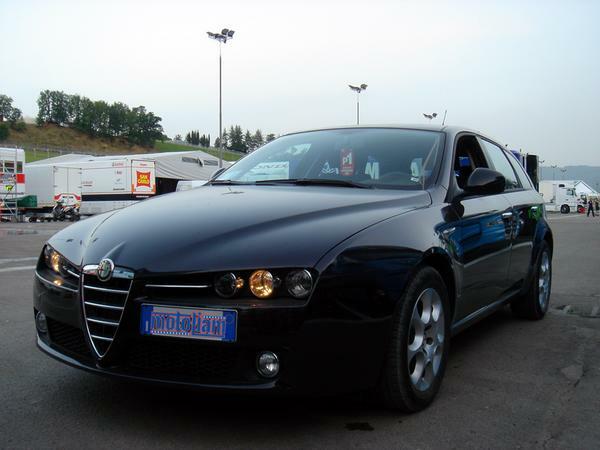 Alfa Romeo, baby! 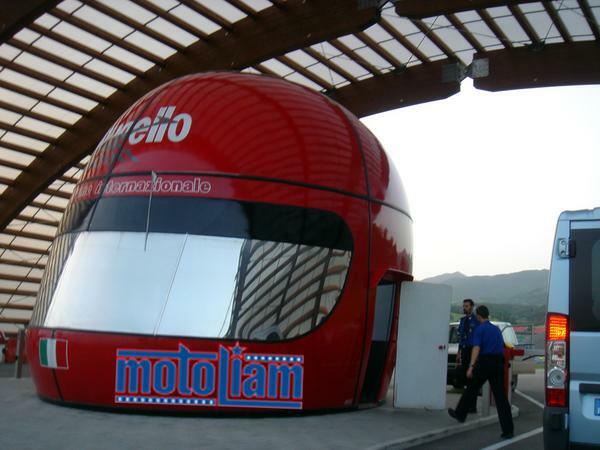 Alfa has a working relationship with Marlboro Ducati, and at every race they are available, the Factory Team travels by Alfa, four members per car. We had this sharp little black number at our disposal. 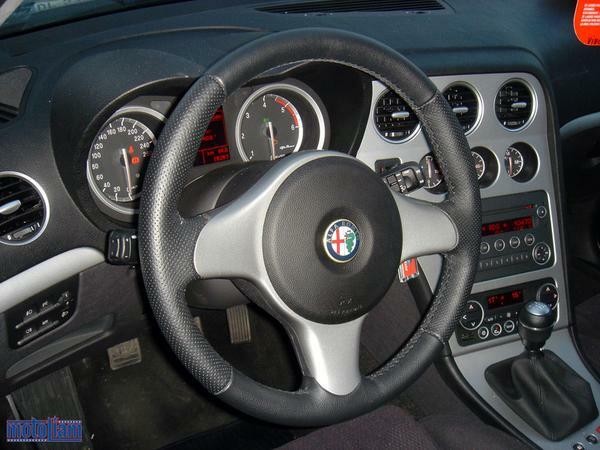 So this is the cockpit of the Alfa! Turbo diesels can be fun . . . . 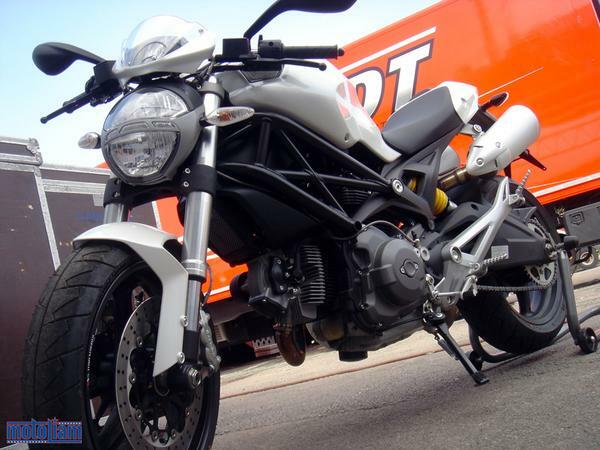 But not as much fun as the new baby Monster 696. I took some time to examine the beast, scouring over the chassis and noting small differences from the pre-production prototypes I had witnessed in the Factory the previous November. It is a very well finished product, sure to make a lot of people very happy and introduce a new generation of enthusiasts to the grand marque that is Ducati. 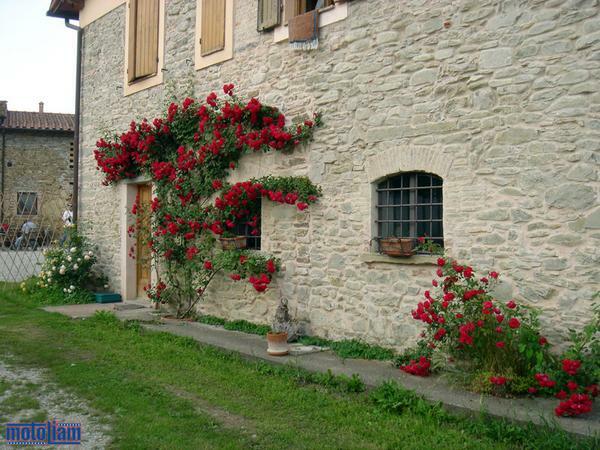 We rolled back to our converted farm house accomodations, known here as "agri-turismo". It is one of the prettiest and most romantic locations I have ever been to. The Team sits and waits for our dinner plans to be finalized. 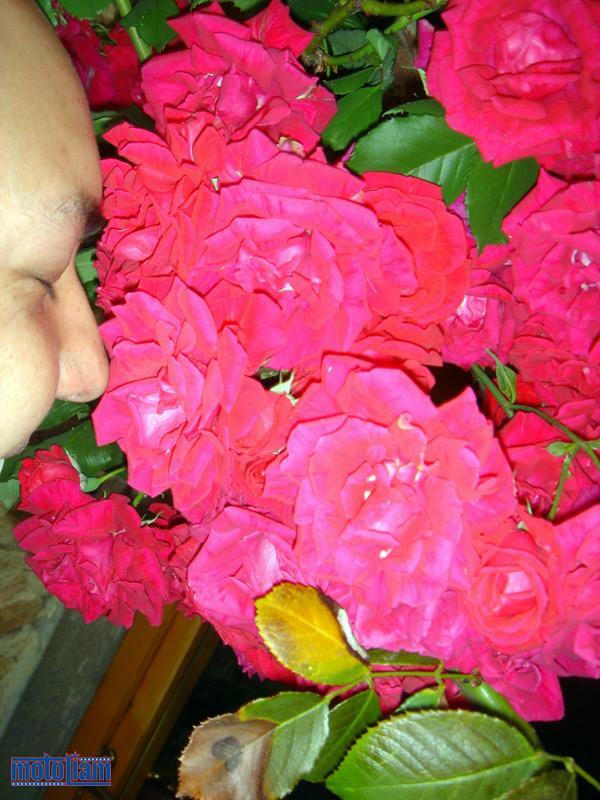 There were roses everywhere, reminding me that love is in the air, spring is in bloom. 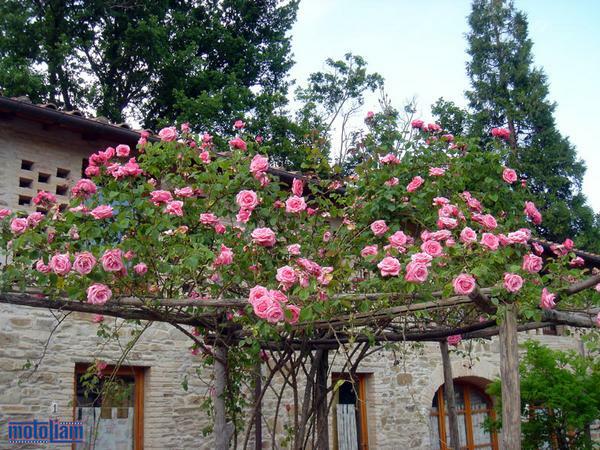 Just a few feet from the door to my room, these gorgeous pink roses waited for me, greeting me every morning and kissing me goodnight when it was time to sleep. 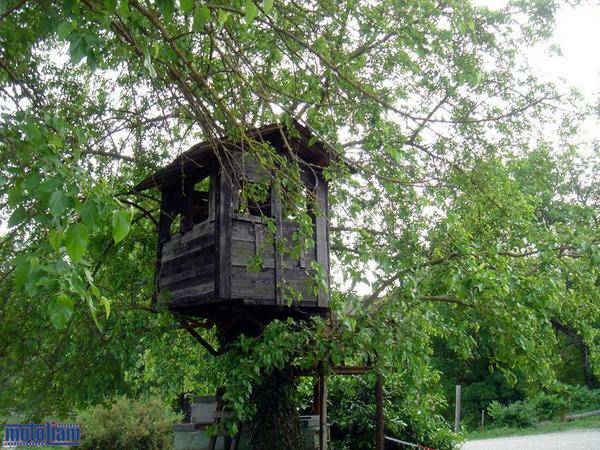 A small treehouse kept the children happy, and there was a sheepdog who wandered about, constantly trying to fetch and chase the myriad of semi-wild cats who lived on the farm. 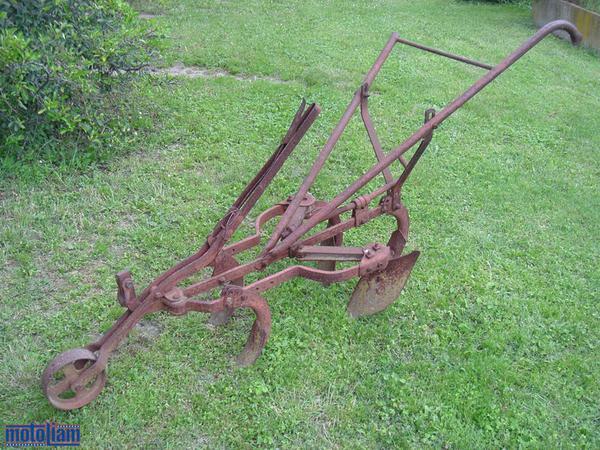 I dug out this old plow from a ditch. This old machine, who's purpose was to help put life into this earth, to continue the cycle, is still beautiful even now - rusted, missing a handle, but pure in its design. Night comes, and the clouds are magnificent. Strong winds moving across the earth, touching all and rarely leaving a trace. As dusk moved in, we headed past the circuit into Scarperia, one of the most beautiful villages in Tuscany, if not all of Italy. The famous restaurant iL Rustico was our destination. 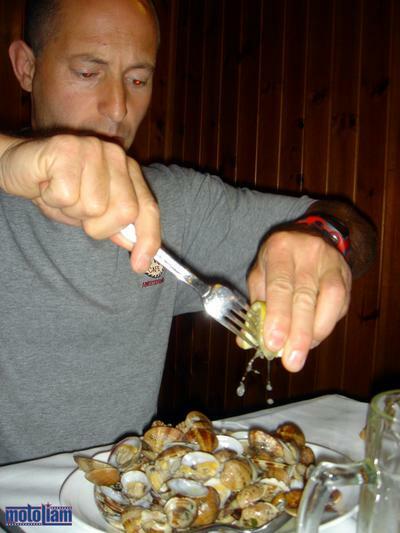 Martin chows down on some righteous clams, the basque mechanic channeling some serious mollusk eating power. I opted for meat, and learned an important (and expensive lesson) in the process. 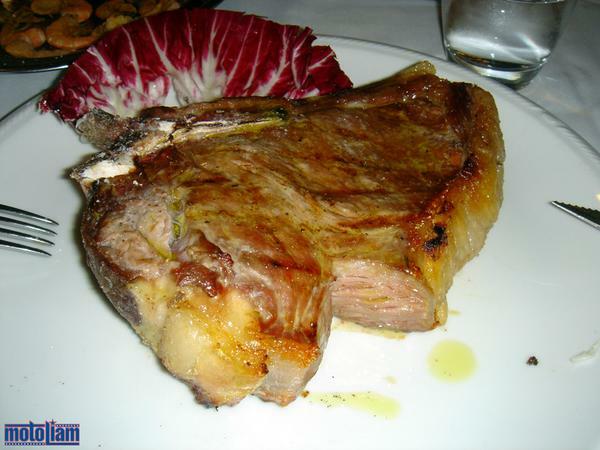 Etto means it's sold by the 100 gram, so be careful when you order the fiorentina! Up early the next morning, and the sun shone brightly into our rooms even before 6AM. 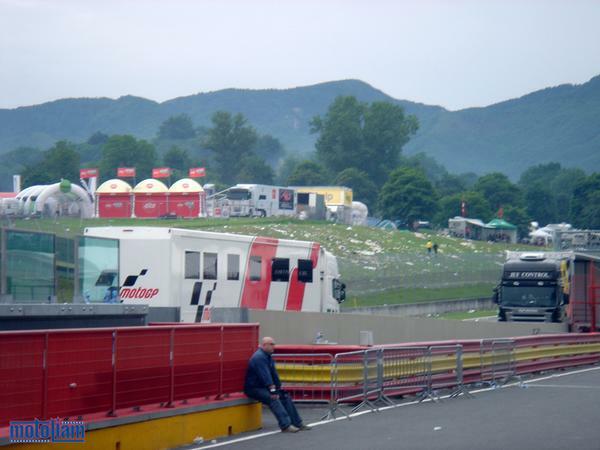 Heading into the paddock, the hospitality units were almost fully built, the luxurious upper deck of the Marlboro Ducati Team gleaming. How did they ever get that up there? 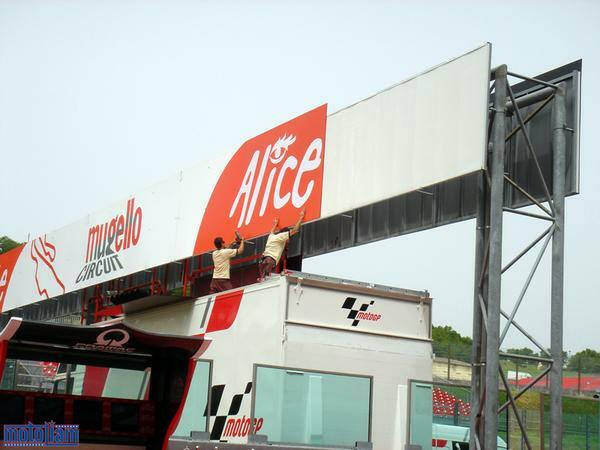 While we layed down carpet and prepared our garage, Dorna workers outside on the main straight prepared the signage for the Gran Premio d'Italia Alice. Inside the garage, we did the same. 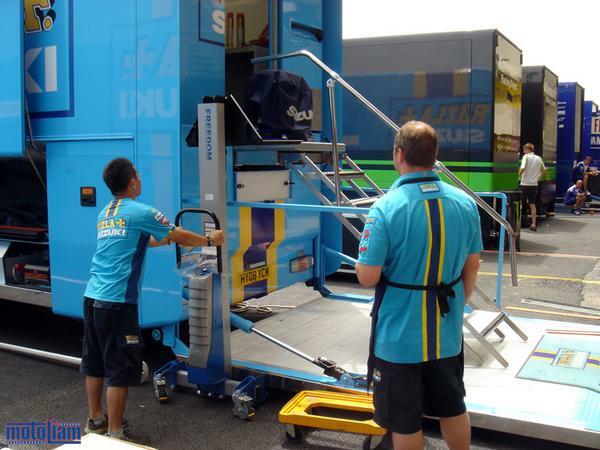 Rizla Suzuki has a cool engine moving device, lifting the engine crate up into the truck. I don't have anything as cool as that, just my back. 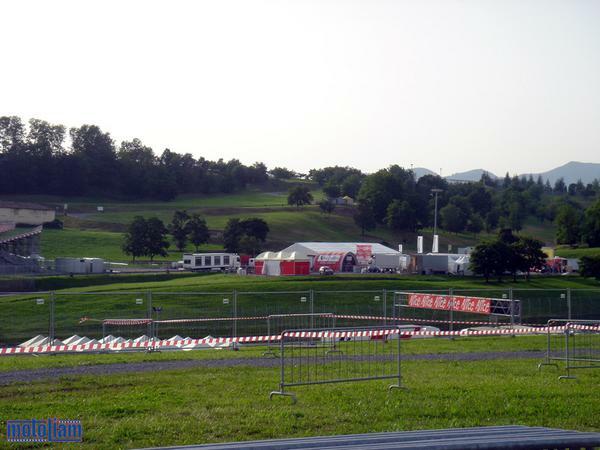 These hillsides, so empty right now, will be crawling with 100 thousand fanatics come Sunday. I might have been one of them. So lush, so beautiful. The naked greenery of this place, the natural energy coursing through this place, it fills me with something special and reminds me of home. A new watchtower, new i-beams of raw steel, complete with shiny welded rivets and large headed bolts. Every day I could look up from the side of my truck, the red Mugello Circuit sign looking down, smiling. I am here. 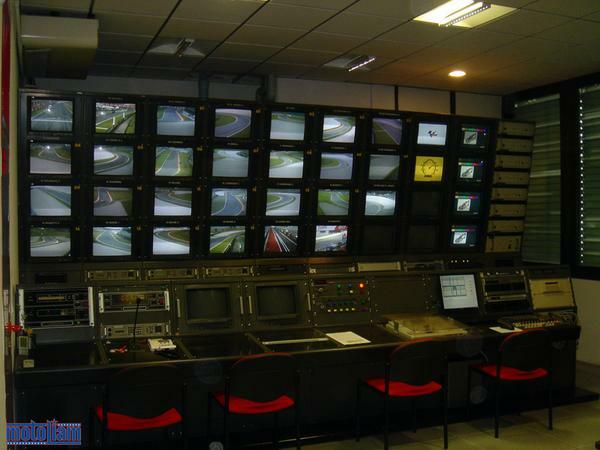 Within the offices of the paddock building, the tv station room full of monitors tracks everyone's progress throughout the circuit. 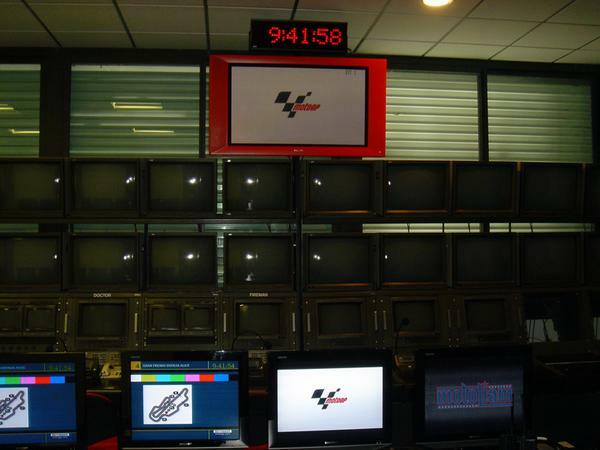 It is from here that the live tv feed is created. One man watches all, see's all, and chooses which camera gets the go-ahead. 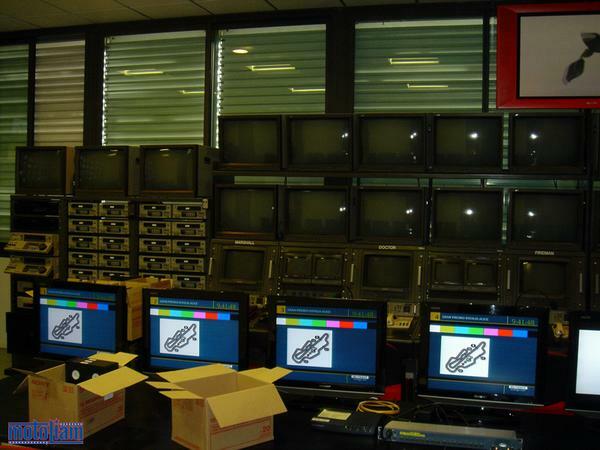 "Cue on camera 4, switch to camera 12, etc". 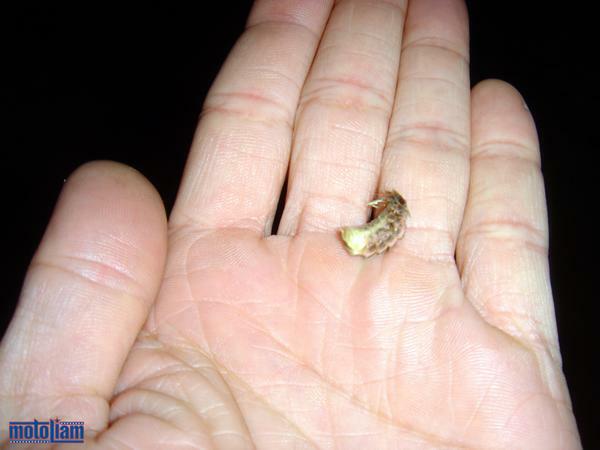 Driving back through the fields after work, we'd pass fresh baby stalks of corn, and cotton was everywhere. Fluffy balls of it drifted along the breezes, making my eyes itch and nose run, and generally, just making my life more difficult. My antihistamines didn't do anything for me this past weekend, but I am a survivor. 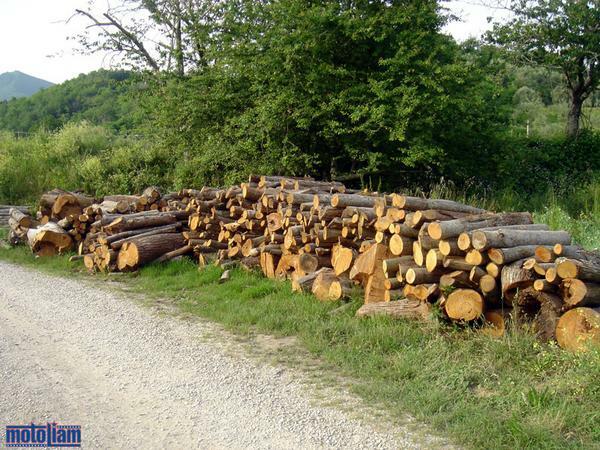 Wood is still commonly used for heat, and there is a feeling of old world here that must be lived. 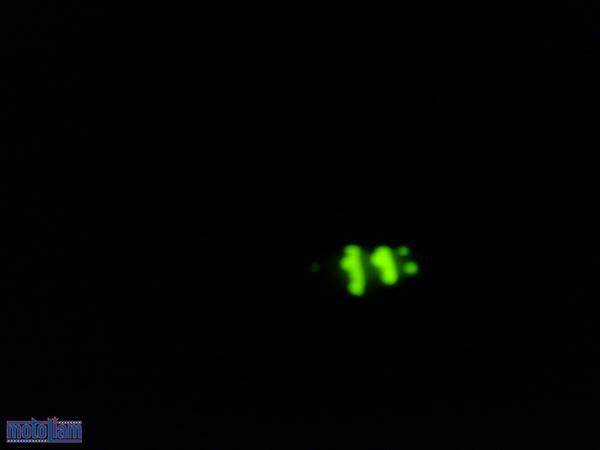 Our rooms always felt moist, the sheets on the beds always damp, the bathroom mirror always cloudy. In the evenings before the race weekend, I'd rest in the courtyard watching the animals at play. Can you guess which one I had? 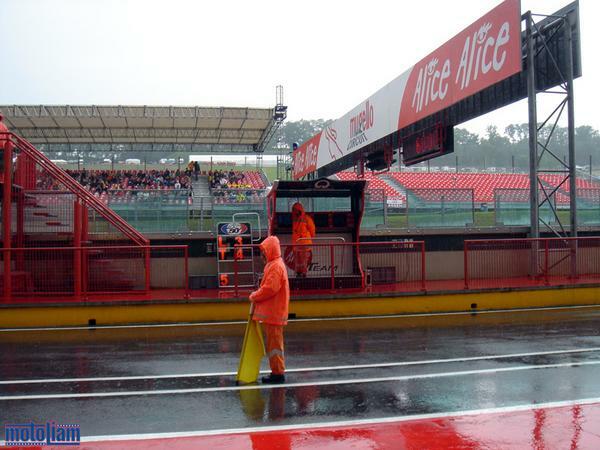 By Friday morning, the rains were in full effect, coming down with a fury and intensity that is Mugello. 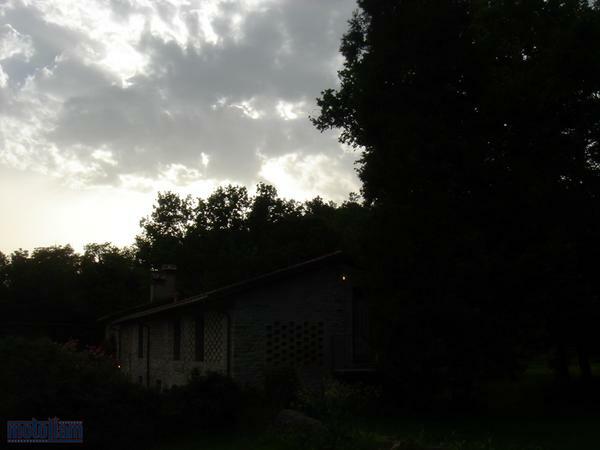 Everything is amplified here, and when the weather is good, it is great! When it's bad, though, it is really bad. Track workers stayed huddled up in their over coats, faces scrunched and squinting against the cold drops and whipping winds. Now this is a shot right out of Hawaii. The rain was cleansing me, washing away the darkness that had clouded my heart, covered my eyes and constricted my chest. 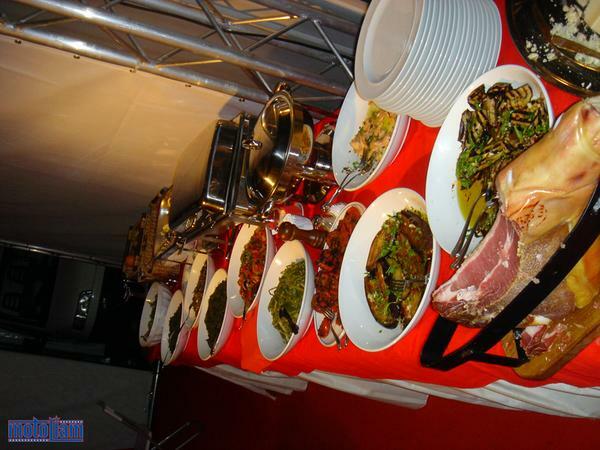 My appetite picked up slightly compared to weeks past, and as this was an Italian GP, our Team was treated to some local foods that were a gift from our amazing chefs. Here's a small sample of how good we've got it this year. The cured ham is decidedly Spanish, though, hahaha. 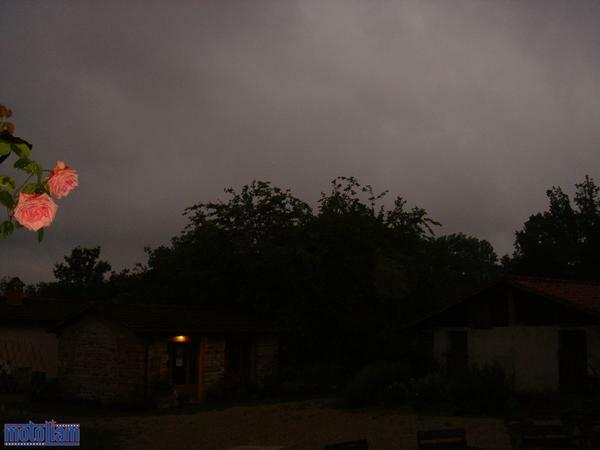 And still, the rains came. 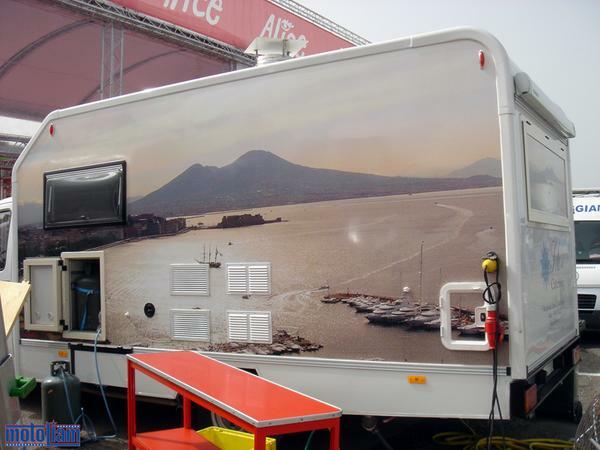 Quick shot I took earlier in the week of the mobile gourmet restaurant on wheels that our reknowned chef, Vincenzo, had built especially for him this season. That's the view of Napoli on the side, his hometown. That night at the house I stayed up late thinking. Most nights I stayed up late thinking, and as we were literally in the middle of nowhere, with nothing to do or see, I had a lot time to contemplate. It was remarkably peaceful and quiet, save for the hum and whirr of all the insects. 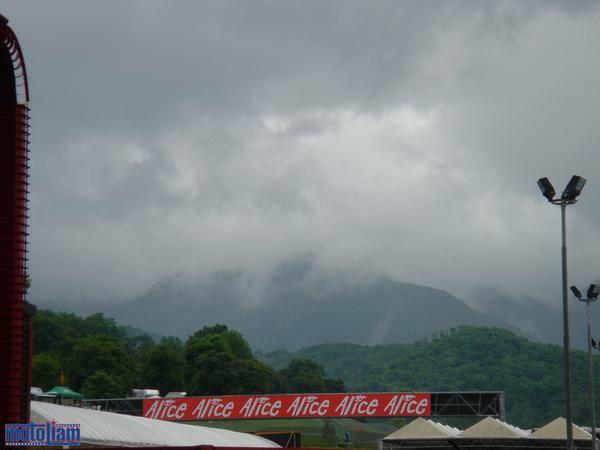 In the distance, you could hear motors screaming and raging off their rev-limiters, cannons going off, and the wild festivities of Mugello rocked on through the nights from Thursday through Saturday. Even throughout the day, large explosions would sound, and whoever was packing the heat had some serious firepower, haha. I listened to my music, I fell back into myself. I breathed deep of this life, slowly, and felt my body renewing itself. A glow caught my eye. 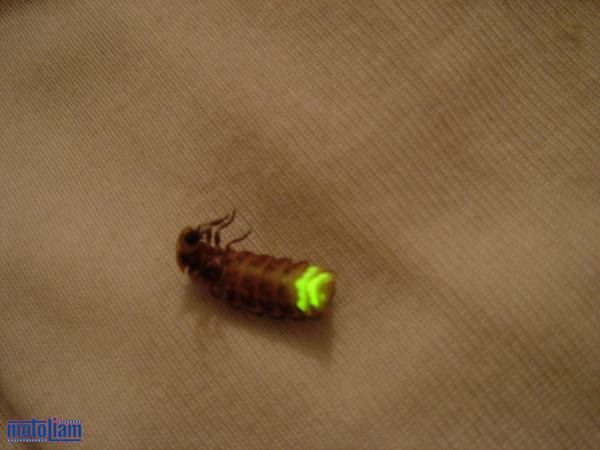 I held this tiny creature in my hand, it's light pulsing. So much light from within, and the lights inside of me were starting to go off, too. I have much to share; experiences and thoughts, love and acceptance, compassion, and a tremendous fire inside. I finally went to sleep at 2:30AM, drifting off to yet more endless dreams. I woke at 4:30AM. 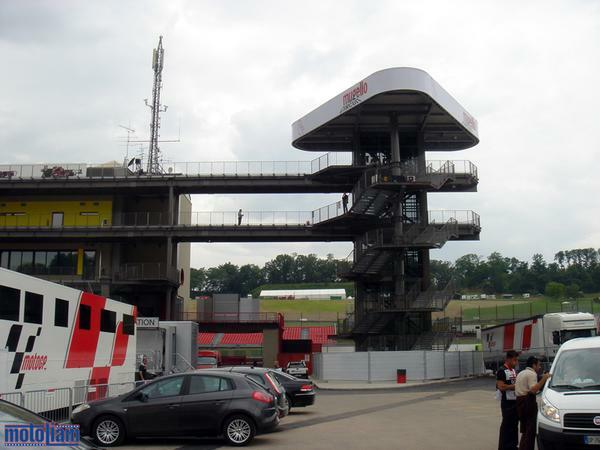 Stepping outside for some air, I sat listening to the party trackside, engines still being run, and audible from several kilometres away. Even the light from the campsite fires lit the sky. I was glowing inside. I woke completely clear headed, and I finally understood everything that I had been going through these past weeks. It all made sense, and I remained awake through dawn, thinking, listening to some of my oldest music, smiling, waiting for my day to begin, waiting for my sun to start shining. 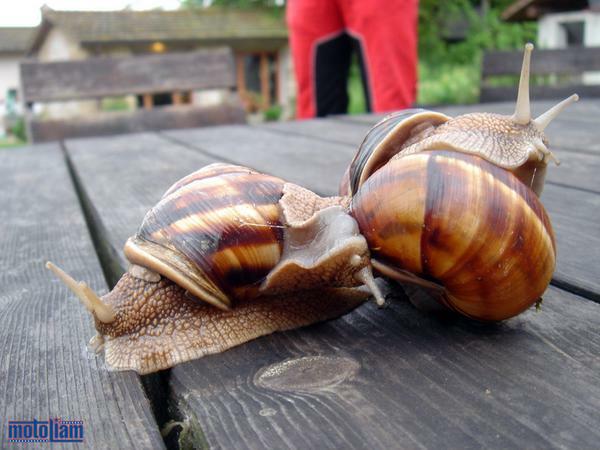 As I waited for everyone else to wake up, I photographed these three great snails. They twisted and squirmed together, intertwined, until one of them had to leave. 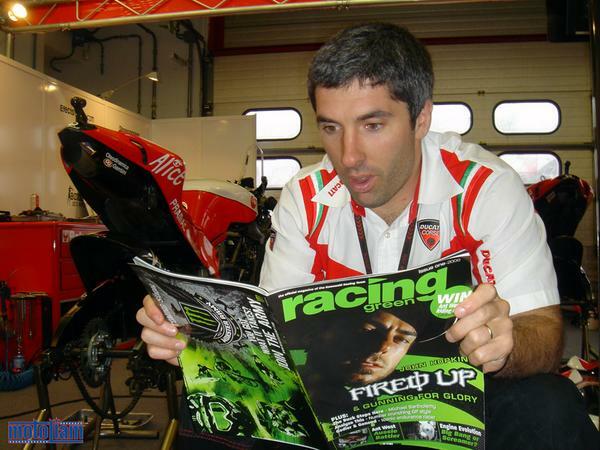 At the track, our Ducati electronics engineer, M.C., studied up on a Kawasaki technical article. Bridgestone brought some new meats to the track, and things were shaping up for qualifying. And then I met one of my all-time heroes. 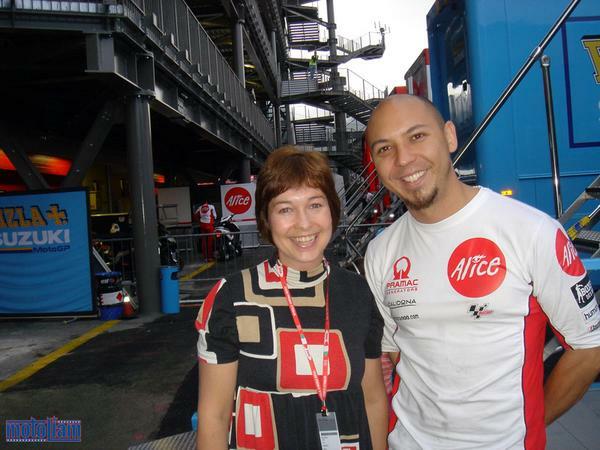 This woman inspired me to make the jump to MotoGP, to risk it all and see what I was made out of. If you know who she is, then you know her history. Her hair might be a little shorter now, and she's preoccupied with her two lovely children, but the fire still burns as brightly as ever inside her. 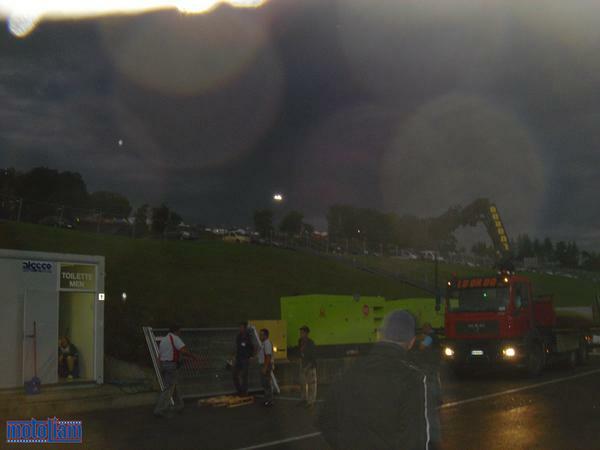 The clouds began to turn and part as I left the track that night. The sofa's upstairs in the Marlboro booth are actually lit from within, though it's hard to see from this photo. 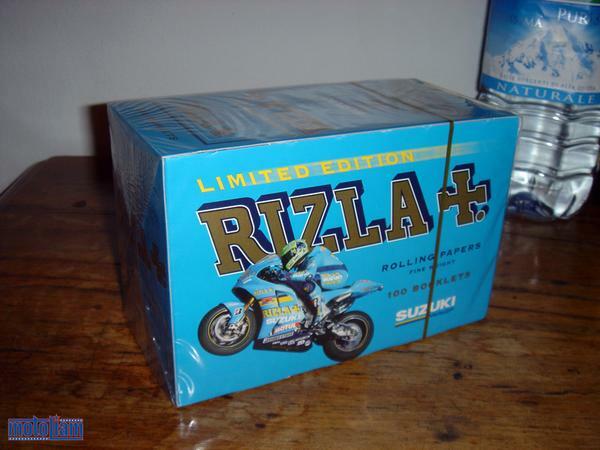 Those of you who smoke Drum, hand-rolled cigarettes (as I had for many years), are welcome to a pack of limited edition Rizla Suzuki rolling papers from me if you can catch me at Laguna or Indy. On raceday, we were ready. The warbirds were primed. Our team, who's been through so much together already, was facing a time where we weren't really in contention. 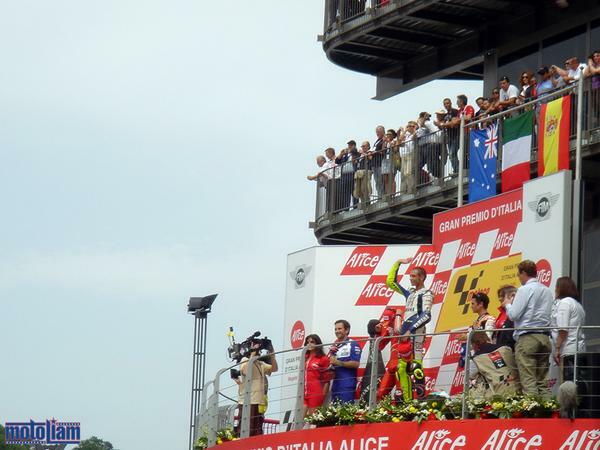 Last year was the highlight of my career thus far in MotoGP, when we podiumed in third place with Alex Barros. This year would be different, but as teams go, we were united. My close friends on the team, they are like family to me. When times are tough, they stick by me, entrench with me, and are ready to do whatever it takes to stay alive and get to that next race, that next level. Onwards and upwards. I waited on the grid for the bikes to loop around on their out lap before staging. 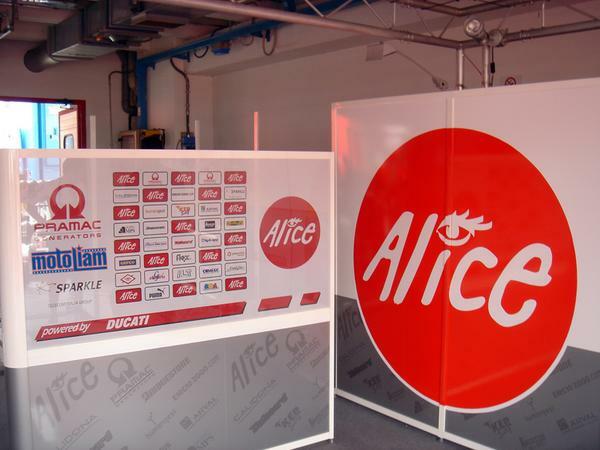 I don't know if you noticed, but this is the Alice Grand Prix, haha. 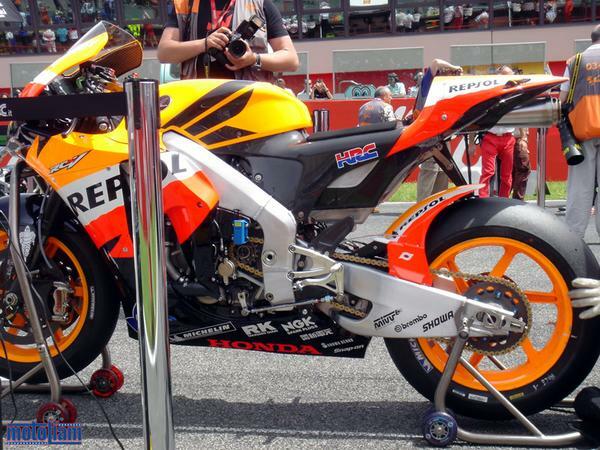 Just a few feet from me, the new pneumatic valved Honda of Tadayuki Okada crouched, waiting to roar and sing to the heavens that it was alive. The race went as I thought, with Valentino walking away from all challengers, his unadulterated love for riding motorcycles carrying him fast and far. The crowds surged in on us before the bikes could even return to the garages, riders dirt tracking to avoid the mobs, and fighting just to stay upright. In front of us, the police were doing everything they could to hold them back, both sides literally forcing the gates and fences inwards and outwards, a contest of wills and emotions. Shortly after this photo was taken, more police showed up and the crowd responded by "leaning in" and really making some pressure. It was incredible to see and be a part of. Over on the main straight, the crowd had completely taken over, their adoration for Valentino eclipsing even the highest walls, the tallest barbed wire fences. 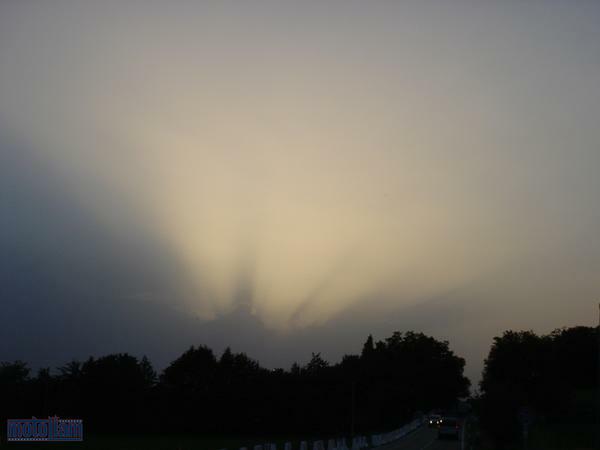 To feel such raw emotion, such vivid and clear rapture, was like a lightning bolt to my chest. It was chaotic and stunning, a true spectacle. 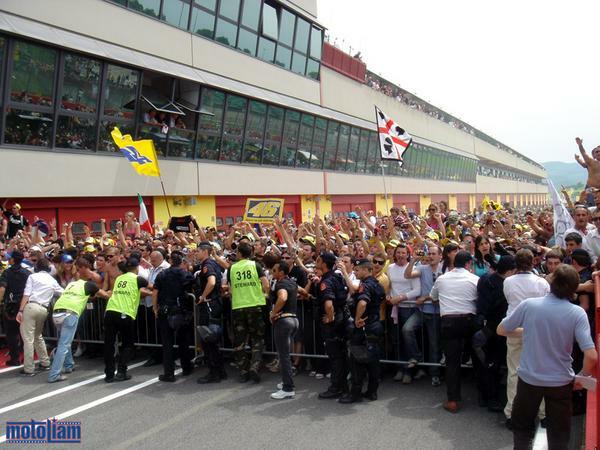 Valentino responded in kind, saluting the crowd and being what he is best. Valentino. After a few hours, the crowds disappeared. 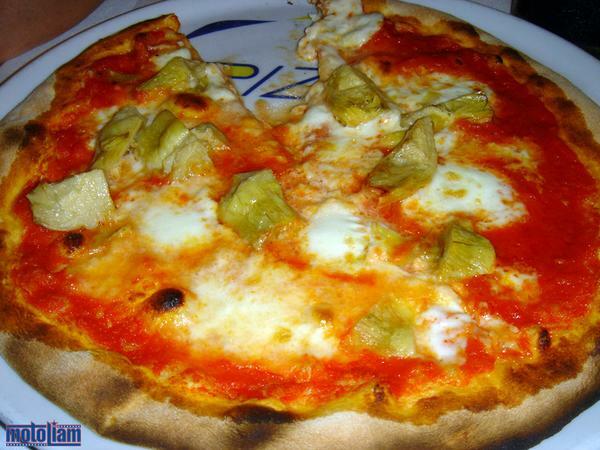 And once the trucks were packed up, we had a short meal at iL Rustico again, this time with artichoke and buffalo cheese pizza. It was a fitting end to a hard week of work, but we have more races to get to, more action and adventure. As I stood outside that morning, I was reawakened, renewed, refreshed, reinvigorated, re-energized, refocused, reborn. My capacity for *LOVE* is even greater than it was before, even greater than I had thought possible. I was alive again, in love with life and everything around me. My purpose was back, to be the best that I could be, in all things, in all ways. I breathed deep, inhaling, feeling time stop around me. I have found beauty in the world again. I am awake now. Goodbye, Michelle. There's so much I want to say, so much I want to share with you. When you look to the Moon and think of me, the wind will rustle through your hair and whisper that I have always loved you. Strong as you are, treating life's obstacles like another chicane to bank on I know you like my brother. I'm proud of you, and happy I'm your friend. Your blog is a road movie we embark on and i'm very grateful to you to open up as much as you do, showing us the good times and the bad times, and, above all, dedicating everything to the 4 letter word that makes the world go round... LOVE. Another awesome update. We get to see something that is normally hidden, experience the lows and now the highs. Good luck for this weekend. awesome post...very vivid. Good luck the rest of the way, hopefully the rewards come for the hard work. When will your book be published? Your write ups are getting better and better. Great stuff. 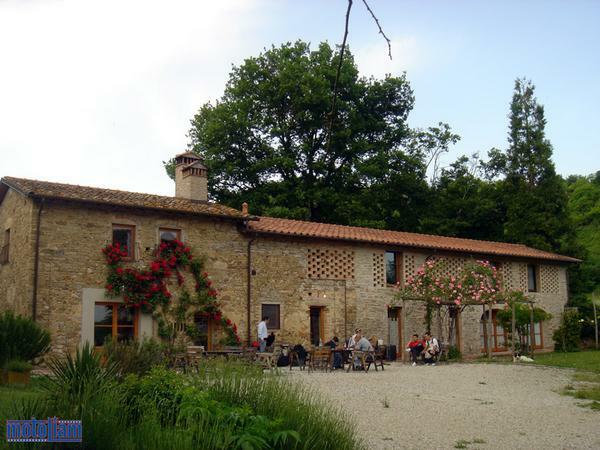 This article proofs again how good Tuscany can be for the inspiration of writers and artists! A good read as always. Glad to see you drinking San Miguel (my most favorite beer in the world because of its taste and I am proud of its Filipino heritage - a wealthy Spanish-Filipino family owns San Miguel Corp ;) ). This is one of my favorite reads to date. Hang in there, buddy. 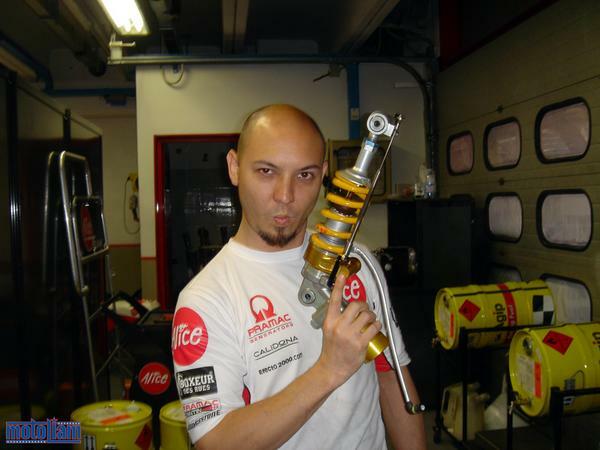 It was good meeting you in Mugello; I was Jordan Miller's guest, and we were introduced in the paddock. 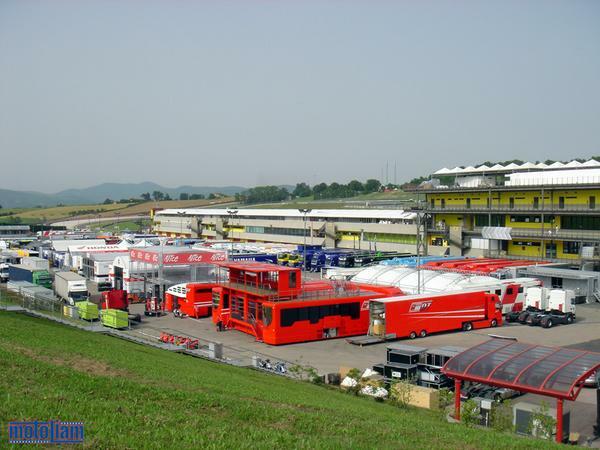 Doesn't get any better than MotoGP in Italy! Liam.. what I can say... your 'report' about Mugello absolutely stunning, the beauty and passion always belong to the Italians. I have a dream to go there (Italy) for my honeymoon.